On Sunday, July 17, 2016, while protecting and serving the citizens of the city he loved, Cpl. Montrell Lyle Jackson was ambushed and killed along with two other officers. Cpl. Montrell Lyle Jackson, was born on December 23, 1983, to Veronica Denise Pitts and Hosea Lyle Jackson in Baton Rouge, Louisiana. He was united in holy matrimony to his loving and devoted wife Trenisha Lashay Jackson on July 15, 2012. One of the most blessed and joyous moments in Cpl. 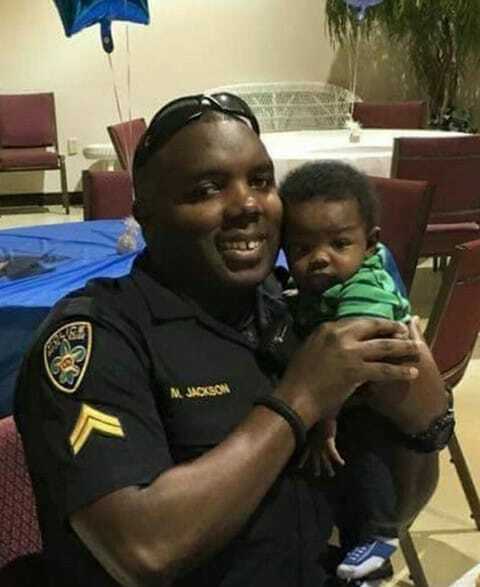 Jackson’s life was the birth of his son, Mason Lyle Jackson, on March 18, 2016.Montrell worked for Baton Rouge Police Department for ten years and loved his job! He took pride in his uniform and his police unit. He was an outstanding police officer who was very honest, thorough and cared about every citizen he came in contact with. He was a God fearing man, faithful husband, devoted father, loving son, cherished brother. Montrell enjoyed fast cars, steak, and shrimp, anything red velvet, and loved buying graphic t-shirts and tennis shoes (he was a sneaker-head).